This is a .8 liter one-person cook pot. 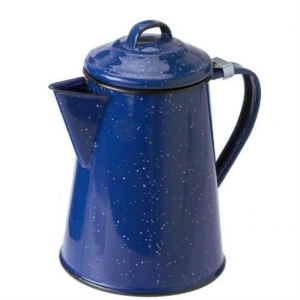 It has a rigid wire handle, a short spout, and a tightly fitting lid. All but the most fanatic backpackers cook something, so I count cookware amongst the "essentials" of backpacking. Of all the pots and pans I've used, none has impressed me more than the MSR Titan Kettle. 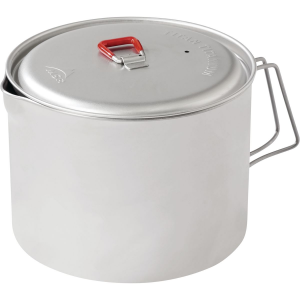 This item is best used to cook simple meals for one person, or as a smaller accessory pot in groups. Size: At .8 liters, this pot holds a generous cup of tea or coffee. I haven't met many who need more than a liter of coffee in the morning, but if that's you, I suggest medical intervention rather than a larger pot. It holds a nearly perfect i person serving of couscous, pasta or rice, boils just enough water to rehydrate an dehydrated meal, and fits 2 ramen packs, or one Knoor Noodles pack perfectly. Ductility: The titanium conducts heat very well, which means liquids boil very quickly in it. Shape: The pot is just high enough and not so wide. It's narrow enough to slide in neatly into the most over-packed bags, and wide enough to stay stable on most stoves. The edges are round enough to allow a spoon to scrape it completely clean. Cartridge Accommodation: It fits a standard size propane cartridge neatly inside! How cool is that! Spout: The lit fits on neatly and leaves a little space, allowing liquid to flow out of the spout. This means you can strain pasta, and make a mean cup of cowboy coffee. Lid fit: The lid fits on tightly, minimizing the chance of a total boilover. Handle: The stiff wire handle is a bit short, giving it a tendency to get finger-scorchingly hot. Bail: There is a little bail on the top of the lid, all coated in plastic. The second time I put the pot at the edge of the fie to keep warm, the plastic melted. 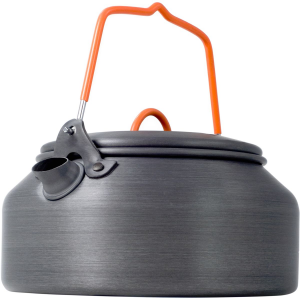 Who coats anything on a backpacking cookpot with plastic? Ductility: Because the titanium metal transmits heat so rapidly, food burns very quickly. If you're doing anything other than boiling water, stir constantly, or rick a thick coating of charred food. Spout Length: The spout is about 3 millimeters shorter than it needs to be, and hence, if you're pouring anything out of the kettle, it tends to drip down the sides. 500 or so miles more on this kettle and it's still going strong! No protection on handles, easy to burn hands. The MSR Titan tea kettle had been on my wish list for a couple years. I finally broke down and made the purchase. I have not been disappointed. The ti kettle is the most versatile piece of gear in my backcountry cook system. It's light enough at 4 ounces to pack, just for boiling water. 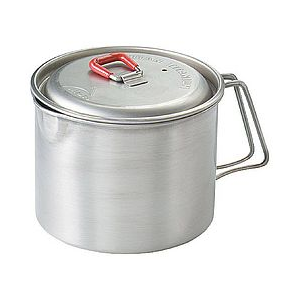 With a fluid capacity of 28 ounces, it boils enough water for myself and one other person. For some people boiling water is enough, for myself I love the option to bake and cook while outdoors. Fresh hot muffin to go with your morning coffee, while enjoying epic views? 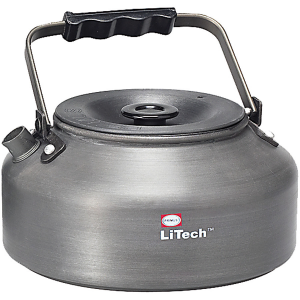 Cooking is simplified, with a diameter of five inches the kettle is wide enough to allow for ease of stirring, keeping the food moving so that it heats evenly. I love my kettle. Welcome to Trailspace, Monica! Thanks for the review of your kettle. Simple, high quality, lightweight pot. This is a great item that I'm glad I purchased. This kettle is well made and durable. It has served me well whether I was cooking over open flame, an alcohol stove, or a canister stove. I try to keep my meals really simple while being really good. I try to make things that require boiling water and dumping in a packet of ingredients. I use this pot as my bowl and eat directly from it and also use it for making tea and then drink directly from it. This is the perfect size pot for me. It isn't so big that I find it to be overkill and it isn't so small that I'm squeezing ingredients into it and trying to prevent it from spilling. I have experienced both of those scenarios with other pots. It cleans up easily with some stainless steel wool that I always tote with me. The quality of construction has left me completely content with my decision to purchase this kettle. Great, lightweight solo backpacking pot. Standard size fuel canisters nest perfectly inside to optimize storage. Quantity markers would be a good addition. I bought this fuel canister specifically because I was looking for a solo cook pot that would nest a standard size fuel canister. This makes for a very effeciently sized cook set. Titanium construction makes this pot super light. At 0.85 liters, it is the perfect size for a solo pot. It's large enough to cook a meal, yet small enough to use as a large mug. This is the only pot I take on trips. The top is wedged on tightly, which can pose a spill hazard if you attempt to take it off while cooking. I do appreciated the fact that the lid has a small plastic coated handle that can be left in an upright position. My one wish is that the kettle had liquid quantity markings scribed on the side. I plan to put a scratch on the inside, marking two cups. Overall, this is a great little kettle and would recommend it to anyone looking to lighten up their load. 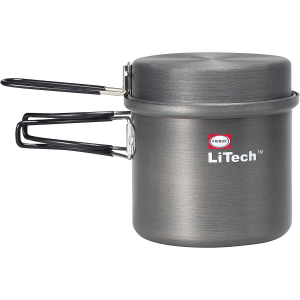 Great ultralight 850ml cooking pot that also serves as an extra large drinking cup. You can easily fit a fuel canister, burner stove, lighter, and washcloth inside. I’ve cooked with it on several 2-3 day hiking trips. Thanks for the review, Rick. Great piece of kit, very usable, ticks 99% of the boxes. 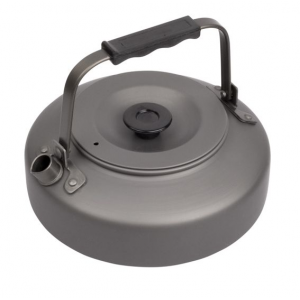 I've been using this kettle for a while now, as it serves as a cooking pot as well as a kettle, and nests with an MSR Titan Cup, alcohol stove, micro gas stove, folding spork, and firesteel, with the rim of a gas cartridge sitting perfectly in the recess in the lid. Not sure how people are using this when they say the handles get hot, as the handles have never gotten too hot to hold on mine, whether I'm using the alcohol stove or the gas stoves. The only pot I have ever owned. It's durable and easy to clean. 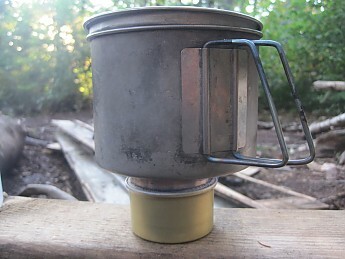 The wide body of the pot makes it great for staying balanced on an alcohol stove. I have had this pot for 7 years and it has been in my backpack for 3000 miles. It's the only pot I have ever owned. The lid is great, snaps on and does not fall of in case it gets tipped over. This has been our main backpacking pot for 8 years. I use this pot with an alcohol stove in the summer. I use this pot with an alcohol stove in the summer. After maybe 200 meals and 4 years it still looks brand new! There's not a dent in it, the lid closes tightly and I'm confident it could survive a nuclear war. It's just too small for thru-hiker hunger, but it's a good investment for a solo hiker with a small appetite. I've found this pot to be all that it is advertised to be. A fuel bottle can conveniently be stored in it. Water heats quickly but you need to remember to use some kind of pot holder as the handle gets scorching hot. Also, I find it pours better with the lid off with hot liquids. I would love to buy another larger one for cooking pasta, etc. for two as this one is a bit small for that but I manage by using less water.